15m has way more range out the top end, still my favorite size for foil kites. Too slow to make up for lack of bottom end (relatively) and a 10m tube is just as effective. 18 and 21m get too truck-like too quickly, and for general hydrofooling about are just ... too much. But for ultimate low-end, with a single stroke, 21m gets you going soonest. The gap between 15 and 18 is quite small, but for differing models can be a bit bigger. 21m is a nice size for light wind, 22m too. I wonder given the even lighter constructions and improving design efficiencies if even larger sizes could gather some interest. If you could some how get consistent 2-3+knots it might work. I think the limit for large LEIs is pumping them up (and efficiency and weight). Foil kites do not have that issue, but large foil kites vs small ones are slightly more hassle to setup and pack down and massively more of a problem to packup in deep water and swim with. I think the 21m kites allow a couple of knots better low end for racing. A recent event here saw winds in the 4-6 knot range. I could barely fly my 15 but those with 21s and 19s could race, but then the wind backed off even more and all but the very best riders went in the drink. If you are going to ride a 21 in light winds you better be sure to make all your transitions, so you need to have your ! @#$ together. I am tempted by a 19 but I dont see it as a bonus unless you are a dedicated racer in which case you better have one because everyone else does and they gonna blitz you. I need to be a better rider to handle one as I sure dont make all my transitions. 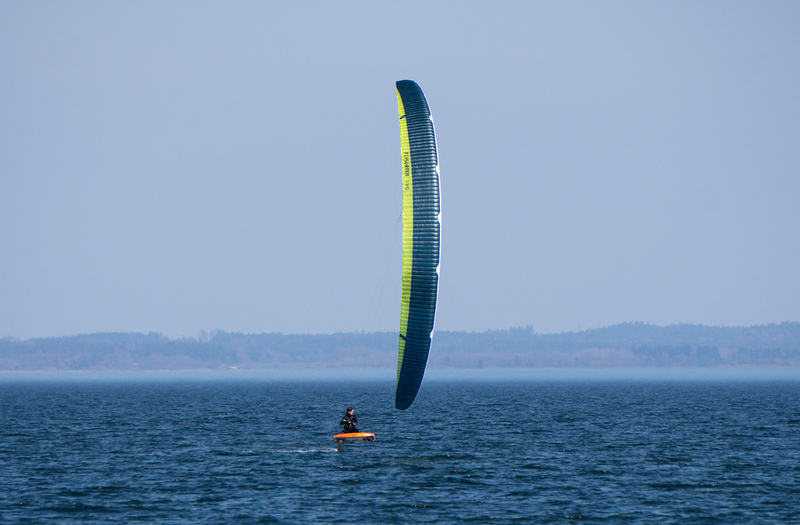 It is impressive to watch a top racer on a 21 in super light winds. Seems inconceivable to generate that much speed in so little wind. Talking of kite size upper limit is deeply linked to rider weight. Overell Jugement is has only poor sense. Obviously for a 110 kg rider, a 21m is worth to increase the lowest end, even on hydrofoil, assuming long lines. From my experience , ultimate foilkite size is in between 15-18m, assuming the kite is very very light weight. True Regis, rider weight is directly connected. So if not stating your weight, one has to assume medium weights meaning 75-80 kg riders, or not far from this. Thats what I always do, if weight is omitted. Those are agile and have a huge windrange, although the gap between the 21 and 18 is minimal. Biggest benefit is on the Downwind. With 70kg and can hold the 21m Aero v2 up to gusts of 14kn, 11-12kn average. Longer lines give me at most a 1kn low-end advantage over my standard 15m lines. Such a small benefit that I rather skip or end the session as the wind is then already so ridiculously light that the kite has trouble flying. I only talk about the latest big race kites, as said, not about the big "other" foil kites. Insane depower, auto re-launch, easy handling but only for... pros. Just like with other kite disciplines and also other sports things go to extremes before they go back to normal. Question is were is the limit?